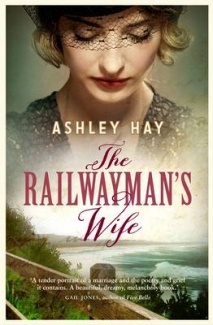 I am a bit late to the party with my reading of The Railwayman’s Wife: it has been widely reviewed everywhere so I shall simply share a few thoughts. Annika Lachlan’s husband Mac has ‘sat out the war’ in a protected occupation but he doesn’t live long enough to realise the irony of his belief that he could stay home and protect his family because the war was ‘nothing to do with us’. In its own quiet, reflective way, this novel interrogates this point-of-view. Isolationism public and private was, in the still raw aftermath of the slaughter in the meaningless ‘war to end all wars’, a not uncommon perspective. But while the battles of WW2 are far away, Mac cannot prevent the war coming home to Thirroul; and as David Malouf wrote so powerfully in his book On Experience awareness of atrocity cannot be un-known. Hay’s characters must somehow accommodate a new consciousness into the peace and beauty of their village. The Lachlan marriage is a good one: Mac is an uxorious man, and Hay peels back the experience of grief as Annika tries to come to terms with her loss. She is among women widowed by the war, but though she did her share of offering cooked meals to help them, she has never really understood what loss is like until now. She finds herself shouting at her little girl, and occasionally being rude to people. She doesn’t hear what is said to her, and she misreads signals because she is absorbed in her loss. While she finds an unexpected pleasure in the competencies she now has to learn, she never wants to confront the fact that her enjoyment of work has only come about because of her loss. The shifting parameters of overwhelming grief are beautifully realised in this novel without ever being maudlin. Hay also explores the idea that time heals. Annika hates the expression, and she resists ‘moving on’ as a betrayal of her memories, surprising herself with occasional moments of pleasure in the here-and-now. But like many a widow she is confronted by the expectations of others that she might be ready for a new relationship, and her own tragedy blinds her to the harm that her rejection causes to a damaged man. This is a fine novel. Ashley Hay is proving herself to be among our best! See Michelle’s review at the Newtown Review (and be sure to subscribe to her own blog as well)! See also Kim’s review at Reading Matters, and yes, Kim, I agree entirely about the cover but guess what, it’s featured on a list of Books with Beautiful Covers at GoodReads *sigh*. Love your thoughts on this one, Lisa. I really do need to get her first book. Not sure if you saw my response on my blog to your comment about the cover… but I’ll repeat the gist of it here anyway. I sat next to Ashley’s agent at a dinner for Christos Tsiolkas a couple of weeks ago (such casual name-dropping — ha!). I didn’t know she was Ashley’s agent until we got talking about Australian novels I’d recently read. Anyway, when I confessed I thought the cover was horrible, she said that cover had ensured the book got placed in every supermarket in Australia. Obviously, I need to do more research on what makes supermarket shoppers pick up novels while out buying the groceries. LOL. I’m not surprised. Sure, everyone wants to win a literary prize because it’s really the only game in town, but publishers want sales so they use these Women’s Weekly/supermarket covers to attract interest from a wider demographic. There aren’t enough readers of literary fiction to be profitable for big companies so they’re not much bothered if they put us off with a soppy cover. Provided they can get a few of us to review it despite the off-putting cover, the word will get out among us anyway. I agree with you and Kim – the cover of The Railwayman’s Wife really is awful. Sure, the cover might lead to more sales, but it doesn’t seem to do justice to the story inside. Great review, Lisa – and thank you so much for linking to my review. I’m not sure how I missed reading this when you first published it (I’m always interested in different takes on books I enjoyed) but I’m glad I found it.